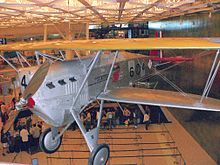 The Boeing Model 15 was a United States single-seat open-cockpit biplane fighter aircraft of the 1920s, manufactured by the Boeing company. The Model 15 saw service with the United States Army Air Service (as the PW-9 series) and with the United States Navy as a carrier-based fighter (as the FB series). The design of the Model 15 was based on studies of the Fokker D.VII, of which 142 were brought back to the U.S. for evaluation as part of the Armistice Agreement ending World War I. Many of the features were similar. The Model 15 had a fuselage of welded steel tubing braced with piano wire, while the tapered single bay wings were fabric on a wooden frame, with spruce and mahogany wing spars and three-ply wood ribs. Wing struts were changed from the normal wood used in Boeing designs to streamlined steel tubes. The landing gear had a straight axle, streamlined into a small 16 in (410 mm) chord wing. The original engine was a 300 hp (220 kW) Wright-Hispano, but when the 435 hp (324 kW) liquid-cooled Curtiss D-12 became available the aircraft was redesigned, moving the radiator from the nose to a "tunnel" under the engine. Along with some other minor design changes to the wings, the design was finalized on January 10, 1922. The Army expressed interest in the new design, and agreed to provide armament, powerplants, and test the aircraft, while leaving Boeing the rights to the aircraft and design. The contract was signed on April 4, 1923 and the first prototype, designated XPW-9 for "Experimental Pursuit, Water-cooled engine", flew on June 2, 1923. The XPW-9 competed with the Curtiss Model 33 for contracts for a pursuit aircraft to replace the Thomas-Morse MB-3A in the United States Army Air Service. Ultimately, both models were accepted; the Curtiss aircraft was designated PW-8 and the Model 15 PW-9. The Air Service preferred the PW-9, which outperformed the PW-8 in all performance aspects except speed, and was built on a more rugged and easier to maintain design, ordering 113 aircraft (only 25 PW-8s were procured). A naval version was also developed, designated FB, and 44 aircraft produced. Deliveries of the first 25 PW-9s began on October 30, 1925. 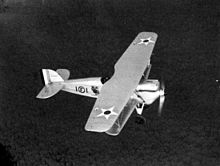 Boeing delivered a total of 114 PW-9s of all variants including prototypes to the United States Army Air Corps between 1925 and February 1931. Virtually all PW-9s served with overseas units, in Hawaii with the 5th Composite Group at Luke Field and later the 18th Pursuit Group at Wheeler Field, and in the Philippines with the 4th Composite Group at Clark Field, Luzon. PW-9s equipped the 3rd, 6th, and 19th Pursuit Squadrons between 1925 and 1931. The FB-1, of which the Navy ordered 16 but received only ten between December 1 and 22, 1924, was not modified for naval operations (for instance, no arresting hook), and was assigned to Marine Corps squadrons VF-1M, VF-2M, and VF-3M, being deployed to China in support of the Marine Expeditionary Force. Two additional planes—designated FB-2—were altered to operate on the carrier Langley with the addition of arresting gear and a straight-across axle for the landing gear. These went into service with VF-2 in December 1925. Generally satisfactory results led to an order for 27 FB-5s, which became the Navy's first fighters intended specifically for carrier operation. They were upgraded to 525 hp Packard 2A-1500 engines, and sported a row of hooks on the bottom of the axle, used to guide the plane via cables on the deck. The FB-5 first flew October 7, 1926 and was delivered to the Navy beginning in the following January, carried on barges in Puget Sound from Boeing's factory to Langley anchored in Seattle's harbor. Hoisted aboard, their first official flights were from the carrier's deck. Of the 158 aircraft built, 147 were standard production aircraft and the remaining were aircraft developed for specific interests. The production runs are shown below with the PW designations for Army aircraft and the FB designations being for the Navy. Three prototypes built for Air Service evaluation. First aircraft scrapped at McCook Field on February 21, 1925, second static tested in October 1928 and the third was still flying in December 1928. 30 produced 1925-26, first production variant, D-12 engine. 24 produced 1926-27, D-12C engine. 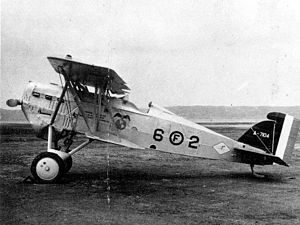 One modified PW-9A, delivered as PW-9B in 1927. 40 produced 1927-28, D-12D engine. 16 produced 1928-34, final production variant. Designation of one PW-9 (ser no. 25-324) re-engined with 510 hp (380 kW) Packard 1A-1500 engine. Boeing Model 58. Designation of one PW-9A (ser no. 26-374) converted to single-seat trainer with Wright-Hispano engine. Ten built as FB-1s from initial order of 16, remaining six modified to other sub-types (FB-2, FB-3, FB-4). Powered by a 435 hp (324 kW) Curtiss D-12. Initial Navy delivery, shore-based only. Two FB-1s modified for carrier operation, 510 hp (380 kW) Packard 1A-1500 engine. Boeing designation Model 53. A Boeing FB-5 preserved at the Steven F. Udvar-Hazy Center. Three built to evaluate 510 hp (380 kW) Packard 1A-1500 engine, floatplane model. Boeing Model 55. One built, experimental model with a 450 hp (340 kW) Wright P-1 radial engine. Boeing designation Model 54. 27 built, production version. Powered by 520 hp (390 kW) Packard 2A-1500 engine. Boeing Model 67. One built, experimental model with a 450 hp (340 kW) Pratt & Whitney R-1340-B Wasp engine. Boeing Model 54. Proposed version powered by a Pratt & Whitney Wasp engine, not built. ^ a b c d e f g h i j Baugher, Joe. "Boeing PW-9". www.joebaugher.com. Retrieved 1 July 2014. ^ a b c Bowers 1989, p. 81. ^ a b Bowers 1989, p.82. ^ a b Bowers 1966, p.69. ^ Ed Phillips (Spring 1985). "Woolaroc!". AAHS Journal. ^ Bowers 1989, p. 84. ^ Swanborough and Bowers 1976, p.55. ^ Bowers 1989, pp. 84–85. Bowers, Peter M. (1966). Boeing aircraft since 1916 (First ed.). London: Putnam Aeronautical Books. Bowers, Peter M. (1989). Boeing aircraft since 1916 (Second ed.). London: Putnam Aeronautical Books. ISBN 0-85177-804-6. Wikimedia Commons has media related to Boeing Model 15. This page was last edited on 6 March 2018, at 20:57 (UTC).